A spotting scope tripod is an equipment that is required to stabilize and elevate a spotting scope into a certain position. It allows you to witness stable, focused, precise and smooth visuals at any level of magnification with ease. All spotting scope tripods possess a set of legs and a mounting head. The legs are used to fixate the tripod on to any kind of surface and the mounting head helps in attaching the spotting scope to the tripod for a better aim. For maximum stability, most of the spotting scope tripods possess a central pole with collapsing legs. Various types of spotting scope tripods exist in the market due to variations in the type of legs or mounting head. Also, the spotting scope tripods can have a different type of construction simply by using different kinds of materials such as aluminum, carbon fiber, steel, titanium, wood, plastic, etc. One of the biggest advantages that a spotting scope tripod provides to a user is the increased level of stability during observation. Holding a spotting scope in your bare hands and trying to observe at a moderate zoom level most often results in a blurred or shaky image. Further, with the increase in magnification or zoom, the level of distortion or blurriness increases significantly. You cannot simply get rid of the natural vibration of your hands even if you try to rest the spotting scope against another firm object, floor or wall. 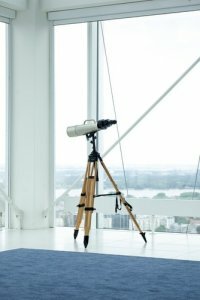 The only way to observe a distant target with perfect clarity at any level of magnification using a spotting scope is to invest in a good quality spotting scope tripod. When you begin your research to find the best and most suitable spotting scope tripod, you will have to become aware of some concepts and factors which you need to consider before choosing the best spotting scope tripod for your conditions. Let us help you sift through some of the factors you need to consider while purchasing the best tripod for your spotting scope. Three types of spotting scope tripods exist namely table top, compact and full-size tripods. Tabletop tripods are the smallest with a height less than 18 inches and are ideal in case you need to kneel, lie down or be seated during observation. They also lack telescopic legs and provide reduced levels of stability. Compact tripods are slightly taller than tabletop tripods and are suitable for situations where you need to be seated during observation. Hunters, hikers, nature observers, etc. favor compact tripods due to the balanced levels of stability, portability, and height that they provide. Full-size tripods, on the other hand, are meant for observation while standing. These type of tripods tend to attain a maximum height of 60 or more inches and possess fully extended legs. A full-size tripod is suitable for long-range spotting scopes with an objective lens diameter of 80 mm and above. A tripod can be made out of carbon fiber, aluminum, titanium, wood, plastic, etc. But carbon fiber and aluminum are the most prominent players in the market. If you pick carbon fiber over aluminum, it will result in a spotting scope tripod that provides you with an extremely lightweight design and a better strength to weight ratio. Also, carbon fiber tends to provide a much better vibration damping capability which helps in reducing the vibrations that could disturb the focus and precision of your spotting scope during observation. Another advantage of carbon fiber over aluminum is that it is immune to corrosion. But carbon fiber is much more expensive as compared to aluminum. In comparison, aluminum also possesses certain advantages over carbon fiber with the biggest of them all being the increased level of stability and rigidness. Tripods with aluminum construction don’t waver on uneven terrains or under harsh weather conditions due to their inherent bulkiness and increased weight. For observing distant objects quickly and clearly, it is necessary for the spotting scope tripod heads to use a fluid pan, tilt or rotate mechanism which can easily be adjusted. A spotting scope tripod with a fluid head is an essential feature which increases the level of stability and steadiness provided by the tripod. This is because a fluid head uses a hydraulic damping system to attain a certain level of steadiness. Also, a better attachment/detachment mechanism must exist. A tripod head helps in mounting the spotting scope on the tripod and hold it in place. It comes in different styles including ball head design, pan/tilt head, pistol grip, panhandles, etc. It is important to choose the right variant for your condition because the type of mounting head used in your spotting scope tripod tends to define the maximum spotting scope weight tolerance that the tripod head can handle. A ball head design uses a ball joint that enables you to move your spotting scope in any direction and along any axis freely and eventually lock a favorable position using thumb screws or latches. Whereas, a pan and tilt head design comes with varying number of handles which can be twisted to lock the favorable position. For mounting your spotting scope easily over your tripod, the tripod head either possesses a screw thread onto which the spotting scope can be screwed and fixed or a quick release mounting plate. With the presence of a quick release mounting plate, mounting a spotting scope over a tripod becomes less tedious and time-consuming. These plates make attachment/detachment process much quicker and easier by using a lever or a clasp. You simply need to attach the plate to your spotting scope and place it on the tripod for an easy mounting process. And if you wish to detach the spotting scope, you simply leave the plate attached to the tripod and use the quick release mechanism instead. This is great for situations where you need to quickly switch between a spotting scope and binoculars while using the same tripod. If you are looking for a spotting scope tripod that you can carry anywhere easily and set up for a quick observation, it is very important for the tripod to be lightweight or else your life won’t be easy carrying around heavy and bulky tripods each time you go out for observation. For increased portability over long distances, overall weight and material composition are two main factors that you need to consider in a spotting scope tripod. Tripod legs made of carbon fiber tend to be super lightweight while providing good strength and stability whereas those made of aluminum alloy are slightly on the bulkier side. Also, you need to be considerate of the size of the spotting scope tripod as well. The bigger the size of the tripod, the heavier is its weight. This means that a table top, compact or mini tripod will weigh less than a full-size tripod. Reduced weight results in increased portability. There is a variety of spotting scope tripods that solve different purposes and can be categorized as compact, full-sized or tabletop tripods. You need to determine which spotting scope tripod best suits your needs. Here is a list of some of the best spotting scope tripods available in the market currently. Amazon Basics 60 Inch Tripod is a full-size spotting scope tripod. It is quite affordable and provides a great number of features without compromising on the quality. 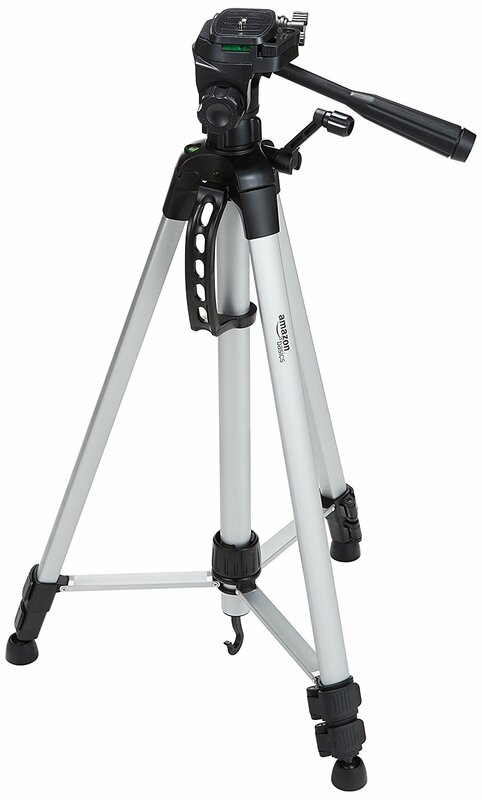 This spotting scope tripod comes with a pan and tilt head design along with a single handle and 2 axes of movement. Although the pan and tilt handle is not the quickest it is super precise once you have located your target. This spotting scope tripod can bear a spotting scope up to 3 kg in weight. This makes it quite versatile and compatible with most of the spotting scopes available on the market. It comes with a quick-release mounting plate and has the ability to adjust its height from 25 inches up to a maximum of 60 inches. The feet of this spotting scope tripod by Amazon has rubberized ends which provide a solid grip on most surfaces and much-needed stability. It can easily withstand harsh weather conditions and environmental forces. It also comes with a hook that is placed around the bottom of the central role of the tripod which can be helpful to hang bags or even weights to increase stability. There are however some features which most of the spotting scope users would find unnecessary. Such features include a bubble level to indicate if the tripod base is in level or no and another one to indicate the leveling of the attached scope. Also, there is a provision to mount cameras in portrait mode, which is not at all required in case of spotting scopes. Rangers 57 Inch Ultra Compact Tripod is an extremely versatile spotting scope tripod available on the market. It is ideal for all your outdoor activities and performs brilliantly for hunters, hikers, and other outdoor enthusiasts. The legs of this tripod can easily be adjusted from 14 inches all the way up to 56 inches and provide adequate extensibility. Also, the tripod legs come in 4 sections which can easily be adjusted as well. Rangers provides its users the choice of material for the legs of this tripod. A spotting scope user can choose from carbon fiber and aluminum alloy. Carbon fiber is much more expensive than the aluminum alloy but has been known to reduce the overall weight considerably. Also, the carbon fiber legs can be adjusted using screw tighteners whereas the aluminum alloy legs can easily be adjusted using flip locks. Flip locks are comparatively easy to use and quicker but sometimes fail to gain the confidence of the user. This Rangers Ultra Compact Tripod comes with a ball head design which is considered to be good for faster target acquisition. This is because the ball head allows free movement in 3 axes and a full 360-degree rotation. Additionally, it comes with a quick release plate for mounting your spotting scope and also to switch accessories with ease. 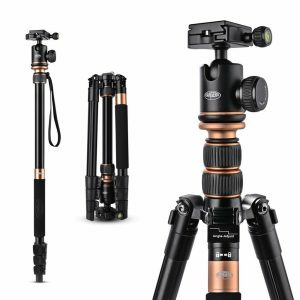 The best thing about the Rangers 57 Inch Ultra Compact Tripod is that it can be folded down to a pretty small size of 14 inches, which makes it compact, portable and suitable for transportation. Vanguard VS-82 Tripod is a tabletop tripod with a 2 axis pan head. It is definitely the best tabletop tripod for spotting scope. 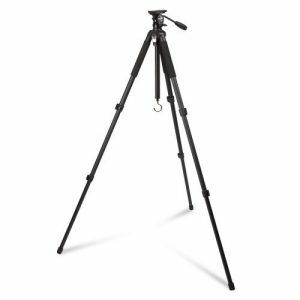 The maximum height that this tripod extends to is about 10.25 inches and remains at only 9 inches when folded. The body of this tripod is made of aluminum which makes it durable, yet slightly bulky. The use of rubberized ends for the feet of the tripod makes this spotting scope tripod have a strong grip on any kind of surface including slippery surfaces such as table tops. Also, with fully extended legs, this spotting scope tabletop tripod possesses a nice, wide stance which is very secure indeed. 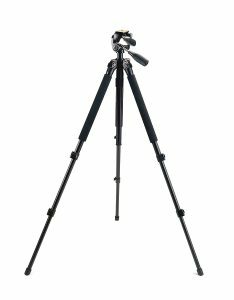 Vanguard VS-82 Tripod possesses angled legs that provide a stable and low center of gravity. This makes it suitable to handle even the bulkiest of spotting scopes. The maximum load tolerance limit for this tripod is around 2.5 kg which you can easily load onto it without fearing a failure. This maximum load limit is sufficient to cover most of the spotting scopes in the market including some of the largest ones. For such an affordable tabletop tripod, it is a great feature. Regardless of a lightweight design, this spotting scope tripod has an awkward shape and is slightly front heavy. The Ultrapod II Tripod from Pedco is one of the lightest and most compact spotting scope tripods on the market. It is designed to be strong and sturdy. It uses a ball head design which allows you to mount your spotting scope or camera at any angle easily and also makes it easy for you to switch accessories. The ball head is known to be the best tripod head for spotting scope. Further, you can lock the favorable position by tightening the locking knob. The maximum load capacity of this spotting scope tripod stands at 2.7 kg which is great for slightly larger spotting scopes as well. With an overall weight of mere 4 ounces, it is one of the lightest spotting scope tripods. Also, with all the legs folded, this tripod achieves a very compact configuration of 7x2x2 inches and attains a solid block type formation. This level of compactness makes it quite portable and an ideal travel companion. It can easily fit into the case of your spotting scope as well and doesn’t need extra packing. The Pedco Ultrapod II Tripod also comes with a cinch strap that makes it easy to attach the folded, solid block of the tripod to any nearby object. It is a very versatile spotting scope tripod that is ideal for several of your outdoor activities. You need to be aware of the fact that this tripod is a fixed height tripod and doesn’t possess the ability to extend. But the presence of the Velcro cinch strap makes it easy for you to attach it to any nearby object and adjust the height accordingly. Swarovski Carbon Fiber Travel Tripod is one of the best lightweight tripods for spotting scopes. 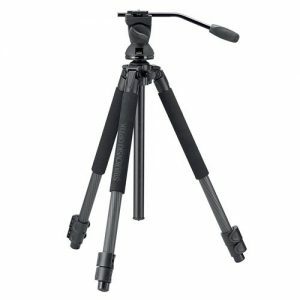 It has a lightweight construction due to the carbon fiber body which further makes the tripod strong, sturdy and ideal for rugged use. It uses a proprietary DH 101 head that employs a clamping system for a much better grip. This reduces the chances of a drop significantly making even the largest spotting scopes less prone to accidental damage. The DH 101 head also provides a fast mount system for easier attachment/detachment of a spotting scope. Also, this tripod has a provision for one-handed adjustment wherein you can adjust the vertical as well as the horizontal axis with a single stroke. Once your spotting scope is in position, a five-tooth locking system locks that position and prevents any further displacement thereby increasing the overall stability of the tripod. 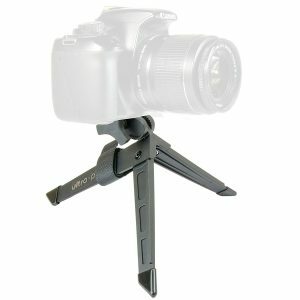 The Swarovski Carbon Fiber Travel Tripod is ideal for all your outdoor excursions such as birding, hunting, hiking, etc. It has the ability to be folded down to 19.7 inches which increases its compactness and portability. The carbon fiber legs are quite lightweight themselves weighing at just 1.4 kg. The presence of rubberized endings on the feet of this spotting scope tripod along with retractable spikes provides an increased level of stability on any kind of surface. Also, it comes with a leveler that enables you to position the legs accurately. Although the Swarovski Carbon Fiber Travel Tripod is slightly expensive and can literally burn a hole in your pocket, it can be considered as one of the most lightweight, compact, strong, sturdy, durable and ergonomic spotting scope tripods on the market today. Vortex Optics SKY-1 Skyline Tripod is the best hunting tripod for spotting scope. This tripod from Vortex Optics is a solid performer and is affordable as well. It features a pan head design along with a micro-fluid adjustment system. The micro-fluid head enables a smooth and quick adjustment across all orientations. The construction is sturdy and durable due to the use of anodized aluminum for the body. The presence of a quick release mounting plate enables much faster attachment/detachment of the spotting scope. Also, it comes with adjustment knobs that allow a better level of accessibility and prevents you from being distracted during observation. Once you have figured out the final position for the spotting scope, it becomes easy to lock that position by simply tightening these adjustment knobs. This provides much-needed stability as well and prevents further dislocation. Vortex Optics SKY-1 Skyline Tripod features anodized aluminum legs that can be flexibly angled in any way. Further, the rubberized endings at the feet of the aluminum legs provide a solid grip and ensure stable positioning even on an uneven terrain. The center pole’s lower end can be removed easily which helps you bring the legs down very low to increase the level of stability. The aluminum body makes this spotting scope tripod quite sturdy and durable but ends up adding a little more weight which makes this tripod bulkier. Another disadvantage of the aluminum construction is that it will eventually end up being affected by rust despite being anodized. This shortens the life of the tripod unless appropriate care is taken. If you are looking for a strong spotting scope tripod that can withstand environmental forces such as strong winds and are willing to give up slightly on portability and light-weightiness, then this spotting scope tripod is the right choice for you. The Bushnell Titanium Tripod is a full-size tripod that is super affordable yet durable. The titanium construction makes this spotting scope tripod extremely durable as well as lightweight. This, in turn, increases its portability and makes it a great travel companion because it can be carried around easily for a long time. The use of titanium also prevents corrosion and abrasion. The level of corrosion resistance in this spotting scope tripod is extremely high as compared to those with the usual aluminum construction. Also, this tripod ends up being very strong and sturdy making it ideal to withstand harsh conditions and uneven terrains. The leg angle of this tripod can easily be adjusted into three positions. This allows you to position the tripod very low to enhance the level of stability. The maximum extension achieved by this spotting scope tripod is 63 inches, which is slightly less as compared to its counterparts. The Bushnell Titanium Tripod incorporates a 3-way pan head design which allows for easier aiming and faster target acquisition. Also, it helps you achieve a stable configuration and fasten the head to prevent any kind of dislocation. Despite the stability, the head isn’t suitable to hold heavy and slightly bulky spotting scopes. This spotting scope tripod by Bushnell has another feature that doesn’t impress its users which is the unusual way of attaching the spotting scope to the tripod head. It requires you to turn the scope around to properly fix it into the head, which is very tedious and time-consuming and tends to put off its users. 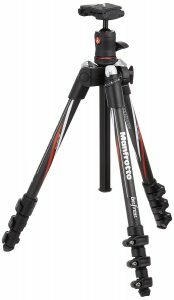 Manfrotto Befree Carbon Fiber Tripod isn’t totally made of carbon fiber, instead, it is a hybrid model with both carbon fiber and aluminum used in its construction. It is an affordable and compact spotting scope tripod which provides the necessary features by utilizing the advantages of each type of construction. It is perfect for those travelers or photographers for whom size and weight of the equipment are crucial. 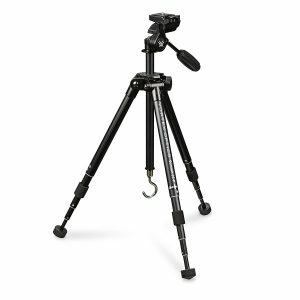 The carbon fiber legs in this tripod possess a two-position leg angle which provides you the flexibility to place your tripod in any position of your choice. Also, the maximum height that you can reach using this spotting scope tripod is 48.4 inches. This lower height makes it super compact and portable. When folded, the tripod spans about 15.75 inches which makes it extremely portable. The portability of the tripod is further enhanced by the lightweight design with the overall weight of the tripod standing at 3.4 lbs. The design of this spotting scope tripod by Manfrotto involves an aluminum ball head which is not a suitable addition at all. This negatively affects the stability of positioning a spotting scope on this tripod and may even result in some scopes being tipped over due to inadequate positioning. This tripod does suffer from some stability issues but you can work around this problem by attaching some weights to it. Overall, this spotting scope tripod is excellent for photography, hunting, bird watching, nature observation, etc. Vortex Optics Summit SS Tripod is the best spotting scope tripod for hunting. It is an extremely compact, lightweight and portable spotting scope tripod that comes at a dirt cheap price. This spotting scope tripod includes a 3-way pan/tilt head design which allows single-handed adjustment and provides an easy attachment/detachment process. The presence of a plate angle adjustment mechanism is also a plus which can be done using a single knob. Further, a quick release mounting plate makes it very easy to attach or detach a spotting scope. This spotting scope tripod by Vortex Optics employs aluminum legs which can easily be extended up to a maximum of 54.5 inches and to a minimum of 6.3 inches after removing the lower end of the central pole. The Summit SS Spotting Scope Tripod can be folded easily and becomes quite compact and travel-friendly by reducing the height down to just 14 inches. 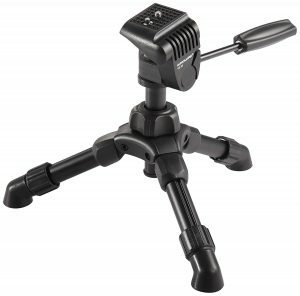 To further enhance the portability, this tripod has a lightweight design with an overall weight of just 2 pounds. The maximum load tolerance limit for this spotting scope tripod stands at 5 pounds which is quite impressive. Vortex Optics Summit SS Tripod features a ballast hook to increase its stability. This hook is located at the bottom of the central pole and facilitates the attachment of additional weights to increase the stability. Now that you are aware of what a spotting scope tripod is and the things you need to consider while purchasing the best spotting scope tripod for the money. With our recommendation of some of the most popular variants currently available on the market, it should be pretty easy for you to figure out the right tripod for yourself. Also, be aware of your needs and the actual purpose of using a spotting scope tripod, this helps you in making the right decision. The best spotting scope tripod is the one that suits your specific requirements and fits right into your budget. The market is filled with several spotting scope tripods manufactured by various brands that can be categorized as a compact, full-sized or tabletop tripod. Make sure that you find the right tripod which can be touted as the best tripod for spotting scope.